After the Ons’ Lieve Heer op Solder museum and Het Grachtenhuis, our last stop was the Museum van Loon, a restored Golden Age canal house. I suppose this would be called a drawing room. 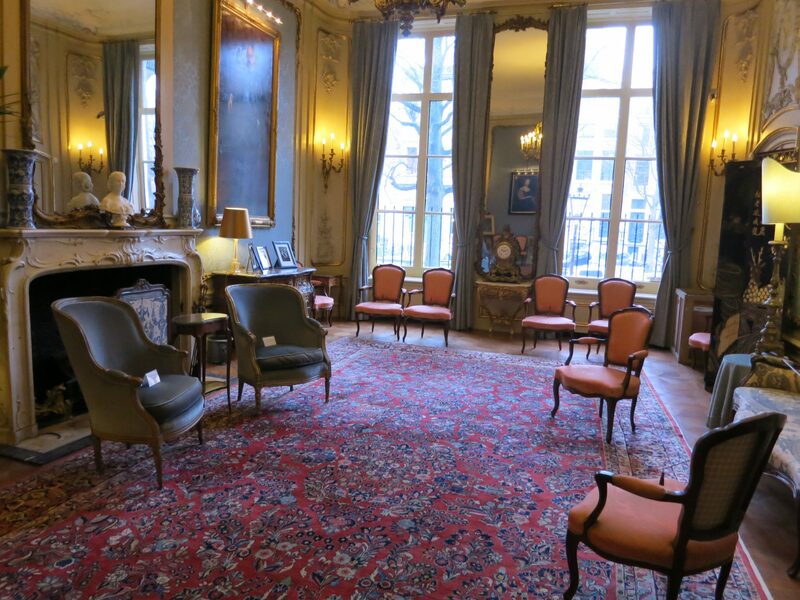 This is what I’d been expecting when we visited Het Grachtenhuis: rooms that gives an impression of how wealthy residents of Amsterdam’s Golden Age lived and, to a much lesser extent, how their servants lived. This museum is named after Willem van Loon, a founder of the Dutch East-India Company (VOC). Granted, some large proportion of the profits from the VOC was based on slavery or on other forms of oppression of native peoples. Nevertheless, houses like this are an enduring and beautiful legacy. I couldn’t resist making this photo sepia. Doesn’t it look Victorian? 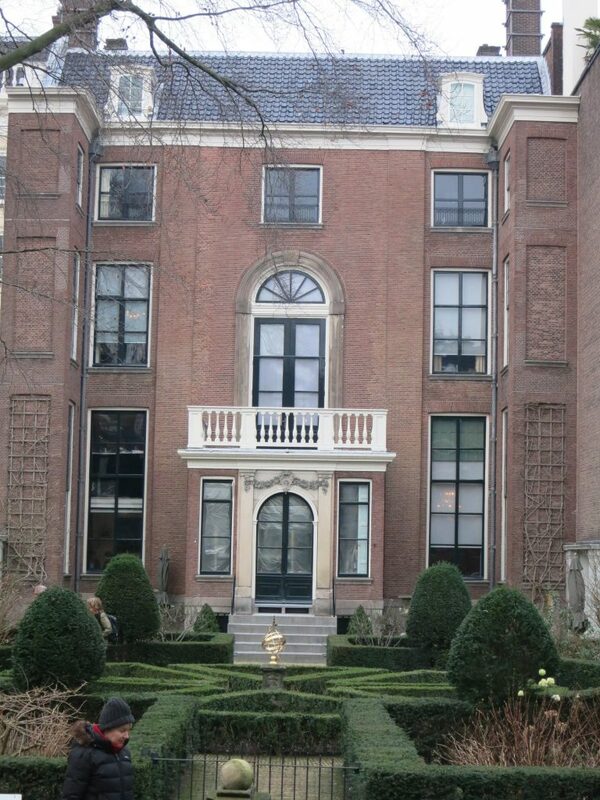 Built in 1672, its first resident was Ferdinand Bol, whose paintings can be viewed in the Rijksmuseum. 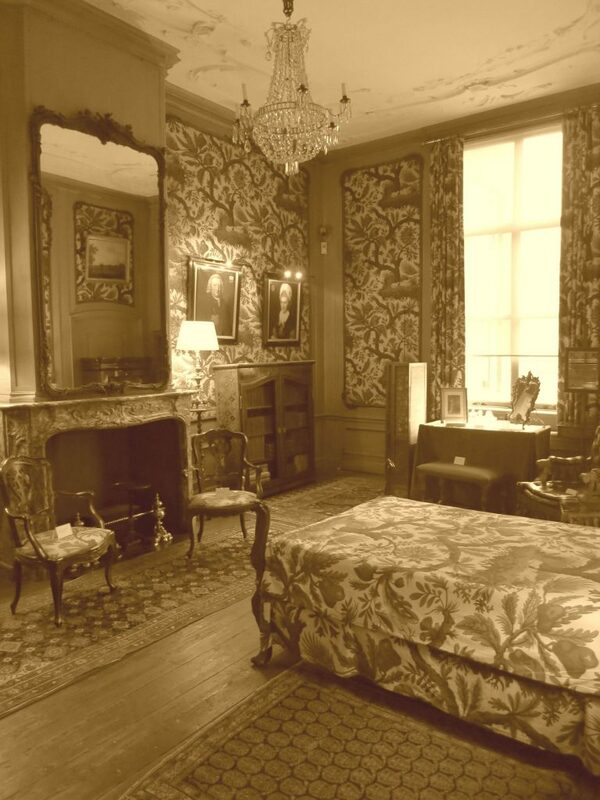 The van Loon family didn’t move in until the late 1800’s. When they did, they filled it with their family’s history, particularly in evidence in the paintings. The house is intact, inside and out, and has been filled with a collection of articles from several different centuries, which is, I suppose, what would have happened with a patrician family like the van Loons. They would have replaced some pieces and kept some old ones, as any family would. There is no set route, and you are free to wander around at will. There’s a lot to examine, if you’re so inclined: period furniture, paintings, porcelain, decorative moldings, chandeliers, and so on. There are a few signs explaining pieces, and notes on all of the furniture reminding visitors not to sit down, but they’ve done a good job at keeping modern intrusions to a minimum. It was quite a restful contrast to the multimedia activity of Het Grachtenhuis. 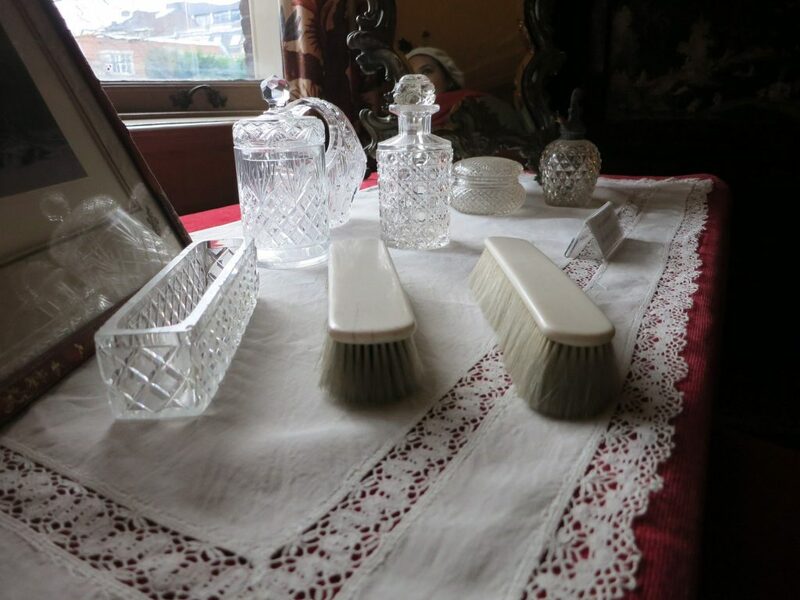 I was particularly drawn to the details: the items laid out on the dressing table in the bedroom, the shiny copper pots on the enormous cast-iron stove down in the kitchen. Perhaps it was because the afternoon light through a cloudy sky was so much like a Vermeer painting. The small garden is laid out in formal style and from the back of the garden you can look back at the house to see its elegant symmetry, somewhat marred by the asymmetry of the houses on either side. A coach house, closed when we visited, backs the garden. 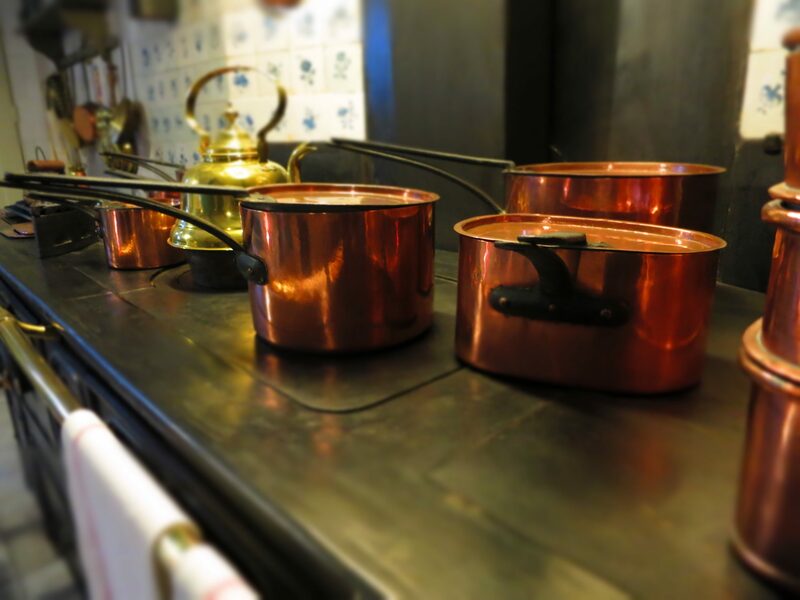 It is usually used to exhibit the van Loon family’s collection of carriages, coaches, and other accoutrements that belong in a coach house. It all seemed very much an Amsterdam-based Downton Abbey to me, with its air of old money and women swishing around in long skirts or drinking tea from very delicate china. If that’s what you’d like to see, this small museum is definitely worth a short visit next time you’re in Amsterdam. If you need more general information about visiting Amsterdam, check out the Netherlands Tourism website. Interesting post, Rachel! I always am amazed just how much history there is in Europe compared to what we have in Canada. Here … something is old (historic) when it’s 100 years old. There … historic can mean that something is several hundred years old, as in the case of the 1672 establishment you’ve mentioned! This looks so cool. I love seeing history preserved. I especially like how they keep modern distractions to a minimum. It really bothers me when you go into an old house like this and they have televisions set up to tell you about the house. It seems so unauthentic. I agree! They had a little sign on a stand in each room, but that was it. Easy to ignore, but nice to have if you’re particularly curious about something. Thanks for commenting! Similar to what Doreen said, anything 50-100 years of age is old in Australia! It makes me feel so young to see places like this (another perk of travel)! I never thought of it that way, Chris! I love all the details in old homes like these. This first thing that came to my mind was Downton Abbey too. Funny, we get all nostalgic for this kind of life, drinking tea in the drawing room, but of course we always picture ourselves as the upper class, not as the servant class! I love the idea of walk around the house and travel to the past. So much history in just one place! We are travelling to Amsterdam on April with some brazilian friends, your posts about the museum and the city arrived in the right time! Great to hear it! I’m hoping to visit one more when I’m there again on Tuesday, If I do, you’ll read about it here!